Home » Big Bang » [News] Big Bang To Sing Opening Theme Of Japanese Drama! [News] Big Bang To Sing Opening Theme Of Japanese Drama! The group’s third single, “Koe wo Kikasete” (Let Me Hear Your Voice), which will be released Nov.4, will be used as the opening number for TBS’ “Ohitorisama,” or “Single,” its agency said in a statement Friday. “The track is a love song that brings out the members’ distinctive voices and harmonies,” it said. Members T.O.P and Tae-yang worked on the original soundtrack for local drama “Friends, Our Story” early this year, but it is the first time for the whole group to participate in a project for a Japanese television series. It will also be the first time for Dae-sung to work on a new song after being injured in a car accident last August. The drama Single features the romance between a successful single teacher and a fellow faculty member, who happens to be 10 years younger than her. Japan’s so-called “Barbie doll,” Alisa Mizuki, will appear as the teacher, while popular actor Teppei Koike will star as the younger employee, alongside other prominent actors including Ami Suzuki and Nao Matsushita. According to YG, the song will prove once again the star power the group has in Japan, considering the fact the group made its debut on Japanese soil only four months ago. 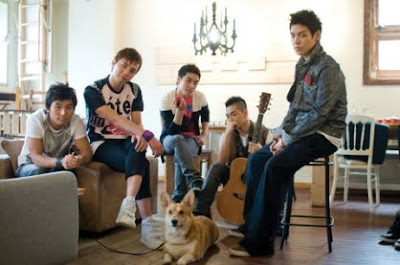 world k-pop news: [News] Big Bang To Sing Opening Theme Of Japanese Drama! "clickable"
0 Response to "[News] Big Bang To Sing Opening Theme Of Japanese Drama!"